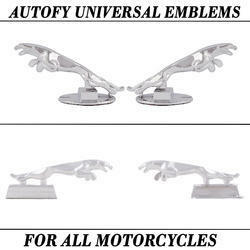 We are a leading Wholesale Trader of autofy bike emblem from New Delhi, India. Autofy stylish Jaguar emblem is available at low and reasonable price. It is made for premium quality plastic and screw fitting to ensure long stick life. The chrome finish of the emblem are the best match with your bike. This can be used with all the bikes like Bullet, Royal Enfield Classic 350, Royal Enfield 500, Thunderbird, Royal Enfield Twinspark, Avenger, Pulsar, Duke KTM, Harley Davidson, Yamaha FZ, R15, CBR, Ninja, Apache, Hayabusa and other bikes.